Devil’s Courthouse, on the Blue Ridge Parkway, presides over some of the most spectacular views in the Blue Ridge Mountains. 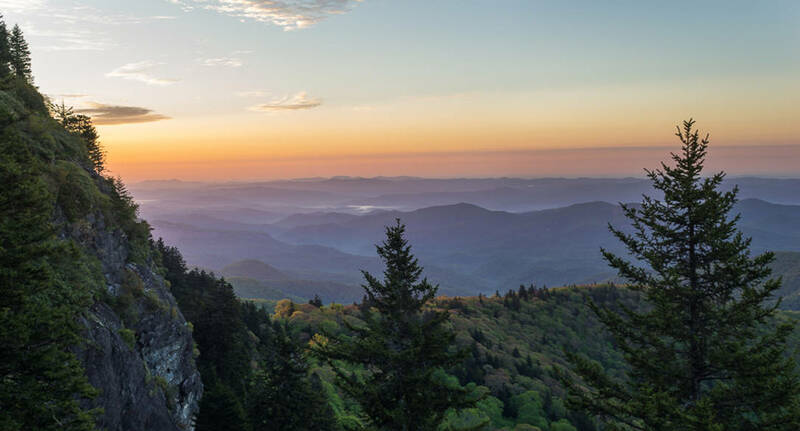 From the top of Devil’s Courthouse at 5,720 feet, visitors can see into South Carolina, Georgia, and Tennessee in a 360-degree panorama. Devil’s Courthouse may have received its name because of the sinister aspect of the rock formation, or because, as legend holds, the devil held court in the cave that lies beneath the rock. In Cherokee lore, this cave is the private dancing chamber and dwelling place of the slant-eyed giant, Judaculla. Devil’s Courthouse provides habitat for a variety of rare, high-altitude plants. Some of these alpine species may be remnants from the last glacial period. Hawks, ravens, vultures, eagles, and peregrine falcons ride the hot air currents that rise from the valley.